Ekymed Spa is an Italian company which operates in the public and private hospitality sector, in Italy and abroad, developing solutions and products with high characteristics of innovativeness. The mission of Ekymed Spa is to solve the real needs unsolved or unperceived by multinationals companies operating in the sector, for which the size of the market for a new diagnostic or therapeutic product represents the decisive element to decide to go on the market. 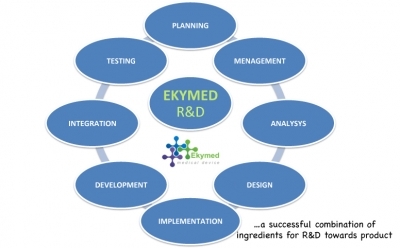 Thanks to the R&D division, Ekymed Spa is able to develop new research ideas and lead these to biomedical product of high impact and innovativeness, meeting the clinical needs of the health sector, along the entire developmental chain, from product certification to marketing .